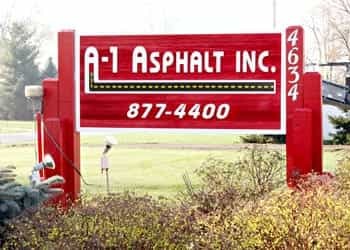 The asphalt paving experts at A-1 Asphalt Inc specialize in a wide range of asphalt paving services, as well as maintenance and repair of asphalt surfaces, curbs and drains. Our professional asphalt contractors know that proper installation and maintenance of your parking lot, road or street remains vital to extending the life of the surface. With decades of experience and a reputation for professionalism and quality, A-1 Asphalt Inc’s asphalt paving company wants to handle your next asphalt paving project. We remain the leader for asphalt paving of driveways, parking lots, walkways and golf cart paths, as well as asphalt repair and sealcoating for any sized asphalt paving project. Learn more about asphalt paving here. While most people do not get overly excited about asphalt parking lots — savvy business owners know that their parking lot area can impact a customer’s attitude before they even walk through the door. The asphalt parking lot experts at A-1 Asphalt Inc specialize in asphalt parking lot paving, as well as maintenance and repair of asphalt surfaces, curbs, drains and other surfaces. Our professional asphalt parking lot contractors know that proper installation and maintenance of your parking area remains vital to extending the life of the surface — and to the success of your business. Learn more about parking lot paving here. Asphalt for new construction paving jobs require the right equipment, the right high-quality materials and trained and experienced professionals who know how to use them. At our new construction paving company, we stand out from our competition when it comes to handling new asphalt construction. Learn more about new asphalt construction here. If a small portion of your asphalt driveway or parking lot is showing signs of age — but not enough for replacement to be an option — then an asphalt overlay can solve your problem while saving you money. Learn more about asphalt resurfacing & overlays here. Our asphalt milling experts are fully equipped to handle any size milling or milling repair project. Let our expert milling technicians prepare your parking lot, road or street for resurfacing by removing the damaged top layer of existing asphalt. A-1 Asphalt Inc can mill from one inch to one foot of asphalt and aggregate base — using a time-tested and proven milling process that makes removal quicker, cleaner and more affordable. Learn more about asphalt milling & recycling here. While asphalt remains one of the most durable and cost effective surfaces, there is nothing you can do to prevent your asphalt parking lot, road or walkway from wearing over time — resulting in cracks, holes or settling. Learn more about asphalt surface patching & repairs here. When cracks start to appear in your asphalt parking lot, road or street, filling them with the proper material — such as the rubberized crack fill used by A-1 Asphalt Inc— can easily extend the longevity of your asphalt surface. Learn more about asphalt crack filling here. Asphalt sealcoating remains a cost-effective and reliable option for protecting and maintaining the life of the asphalt surfaces around your home or business. Sealing your pavement will not only protect your investment, but will make your asphalt look brand new, help the surface to resist oil, gasoline and other chemicals and extend the life of your parking lot, roadway or street. Learn more about asphalt sealcoating here. Asphalt pavement marking and striping can make all the difference in the look and function of your parking area. Parking lots that are properly laid-out and painted will create a sense of safety and organization for vehicular and pedestrian traffic — and remains an essential and vital aspect of most parking lot paving projects. Even a perfect paving job can turn ugly with inadequate striping. Learn more about asphalt line striping & stenciling here. When you need a new asphalt driveway or asphalt driveway repair, the professional asphalt driveway contractors at A-1 Asphalt Inc will handle all aspects of your driveway project from start to finish. Learn more about asphalt driveway paving here. Even a perfectly paved asphalt driveway will wear over time, causing cracks to appear, striping to fade and uneven surfaces to develop. The asphalt driveway repair and maintenance experts at A-1 Asphalt Inc can handle any size residential driveway maintenance project — while saving you from costly resurfacing expenses. For more information on how A-1 Asphalt Inc’s professional asphalt paving contractors can help you with your next project, contact us today or call us directly at (800) 871-4401 We proudly serve Grand Rapids, Kalamazoo and the entire West Michigan area. Serving Grand Rapids, Kalamazoo & West Michigan! Web Design & SEO by Internet Marketing Company Web Traffic Partners, Inc.